ECO CITY, is a Sustainable Tourism and Mobility company in Barcelona. Created in a communicative spirit, it promotes urban movements through sustainable mobility vehicles and the commercialization of quality tourism products. After maintaining a long history with more than 17 years of presence in the streets of our city, TRIXI, now ECO CITY, has become the most modern platform for communication and development of tourism services at the local level, consolidating itself as the first company in the city. 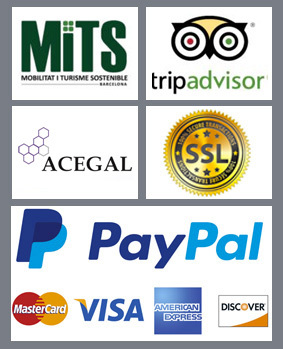 sector, through a business model referenced by the main tour operators and large companies that sponsor it. DESIGUAL, MAREMAGNUM, PANS & COMPANY, TURKISH AIRLINES, GREENWAYS or MOVISTAR among many others are just a small example of large companies that have relied on our dynamic advertising services over the last few years. The significant difference between our company and others in the market, is mainly the business model that develops and the vehicles we maintain in our fleet. The Velotaxi is a vehicle of high performance, high comfort for passengers and excellent advertising support thanks to its unique technical characteristics and design. Its engine allows it to be a vehicle with electric assisted traction framed inside of bicycle, this authorizes to him to move through the areas of the city restricted to the road traffic among other many advantages that its category allows to him. Another great value of our business structure is collaboracionismo, all of which we compose the current team are committed to the project that has been developing for more than a decade, integrating our services in close collaboration with other social and cultural entities of the city. The Trixi Amics program is a pioneer in the development of transfers of elderly people and/or with reduced mobility problems in the most inaccessible areas of the city such as the Ciutat Vella. Thanks to our service, we can support entities and organizations that manage and coordinate this group of neighbors residing in the center of the city, facilitating the transfer to the healthcare and hospital centers where they must carry out medical follow-ups and other treatments. This new stage integrates a young team, composed of boys and girls from 23 to 35 years old, all of them with a sports and professional spirit, excellent communicators of all the content that we commercialize through our platforms in several languages. The extensive knowledge of the environment in which they develop and their environment after receiving the periodic training we do to our drivers, offer the end user a pleasant personalized experience. The implementation of a powerful digital platform, provides our clients and collaborators with an exceptional communication and marketing tool, with their marketing campaigns being expanded and their sales in the different media we propose. The creation of a tourist map that includes the whole city and the geographical limits that border the Besós River Natural Reserve, proposes as a printed medium the integration of new areas of interest, hitherto unexplored in detail, such as the Port Forum and all the Agenda of activities that in that area are developed throughout the year in what has already been consolidated as the most important point to hold events of mass audience call in the city of Barcelona.